U.S. Army 1946 - 1949 - Japan and South Pacific. 1 year, Syracuse, New York Medicine & Obstetrics - 1 year, Syracuse, N.Y. General Practice 5 years. Fellowship in Pediatric Pulmonary Disease for 2 yrs. Instructor in Anesthesiology at Univ. Of Oregon Med. School. Private Practice of Anesthesiology at Emanuel Hospital and Meridian Park Hospital. Presently studying biology and geology at Portland State University and Portland Community College as a hobby. I was born in Pittsburgh, PA, but don't know much about it, since we moved to Sault Ste. Marie, Ontario, when I was 4 months old. Dad worked in my uncle's music store until the Depression hit; when we moved to New York City. I was 5. Mother and Dad were employed as cottage parents in a delinquent boys' facility –no place for a little girl. For 2 years I lived with an Irish Catholic woman and her 20-something daughter. My parents got me back when Dad was hired by the U.S. Post Office... We rented a second-floor apartment in a NJ town across from NYC.. One day we smelled smoke; our landlady was moving things to the garage. The town's volunteer fire department arrived, and they carried Mother, me, and the dog I'd rescued from under the bed, down to safety. A year later, to Mother's delight, Dad was transferred to Denver. (As a teen, Mother had lived in Boulder and loved it.). WWII hit; we moved from a North Denver rental house a block from my junior high to a nearby suburb. Eventually I got a scholarship to the University of Colorado, where I majored in biology instead of geology because "women geologists can only teach or look through a microscope." The UC Hiking Club was a godsend. I hiked and/or rock climbed with them every Saturday. Esther was born m French Gulch, California, on July 17, 1912, and died in Portland, Oregon , on March 29, 2010. She was an avid amateur botanist, birder and geologist, and enjoyed sharing her knowledge with others on hikes, walks, and field trips. She was president of the Native Plant Society, Oregon Agate and MineralSocietyand GeologicalSocietyof the Oregon Country. 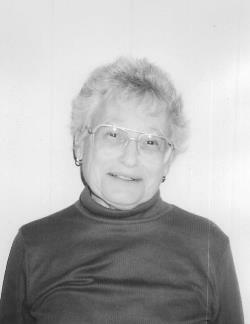 She and husband Bill joined GSOC in 1975, and she served as president in 1993. In addition to her presidency, she servedaslibrarian, on various committees, and was Chairman of the Banquet Committee for several years. She not only organized the banquets but supervised the making of the place cards. Because of her artistic talent, one year she hand-painted all of the banquet place cards! Each place card was a different scene from the President's FieldTrip. HerPresident's Field trip was "Puget Lowlands to Cascade Highlands," with the assistance of John Whitmer. We learned about Puget Sound and the North Cascades, including Anacortes, Concrete and Washington Pass. She was always gracious, cooperative and available when anyone help with anything. A memorial service was held for Dr. Donald Botteron Tuesday July 31, at Capitol Hill United Methodist Church. He died July 24, 2001 at the age of 84. Dr. Botteron was born July 29, 1916, in Columbus, Ohio. He was raised in Wood River Illinois, and graduated from the Universityof Illinois. He earned a doctorate in chemistry from Northwestern University. He was a professor of organic chemistry at Syracuse University, from 1943 until retiring in 1981, when he moved to Portland. He was president of GSOC and Portland Astronomers (now Rose City Astronomers) . He led GSOC on a trip with Ellen Morris Bishop to the Wallowa Mountains for the 1994 President's Campout.